The G3 is here, but is it a worthy successor to the G2? 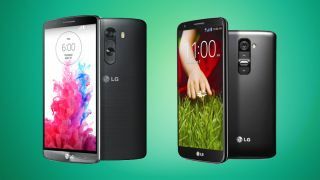 The arrival of the LG G3 surprised nobody as we all knew it was in the works thanks to a volley of leaks and even LG itself confirming the handset on numerous occasions. There's fierce competition at the top of the mobile market, with the G3 joining the Samsung Galaxy S5, Sony Xperia Z2 and HTC One M8 in the flagship enclosure. Plus, with the likes of the OnePlus One and Huawei Ascend P7 peeking over the fence we're becoming spoilt for choice. With a brand new screen, larger body and extra power the good news is that the G3 builds on 2013's LG G2 in several areas. We've gone through both handsets to see if the LG G3 is enough of an upgrade on last year's offering to see it tackle the burgeoning mobile market. The biggest visual difference between the LG G3 and the LG G2 is that while the G2 is unashamedly plastic the LG G3 has a body that looks and feels like metal. Don't be fooled, it's still every bit as plastic as the G2 but the metal effect is surprisingly convincing and the back cover is removable, which the G2's isn't. As you'd expect the 146.3 x 74.6 x 8.9mm LG G3 is also bigger than the 138.5 x 70.9 x 8.9mm G2, but not enormously so and it's no thicker. At 149g it's a little heavier than the 143g LG G2 as well. Both phones relegate the buttons to the back of the handset, but they've been re-designed on the G3 to be smaller and arguably more stylish. Both phones also take a microSIM card, but there are a few other differences between them, as while the LG G2 has its speakers on the base, the G3 has them on the back and the G3 has a microSD card slot with support for cards of up to 128GB, which the G2 doesn't. One of the biggest selling points of the LG G3 is surely its display, which at 5.5 inches is pretty huge and at 2560 x 1440 is very high resolution, giving it a pixel density of 538 pixels per inch. The LG G2 is no slouch in the display department either, but at 5.2 inches and 1080 x 1920, giving it a pixel density of 424 pixels per inch, it's both smaller and lower resolution than the LG G3. However both phones have IPS LCD screens. The LG G3 is a beast under the hood, thanks to a 2.5 GHz quad-core Snapdragon 801 processor, 2 or 3GB of RAM (depending on the internal storage capacity) and an Adreno 330 GPU. The LG G2 has the same GPU, but it uses a 2.2 GHz quad-core Snapdragon 800 processor and has 2GB of RAM, so while it was a top flight device last year it has decidedly lower specs than the G3. Both phones have a choice of 16 or 32GB of built in storage.